The hurricane (named after one of my sons) hit Florida, especially Pensacola, and especially Pensacola Beach. Mobile and Dauphin Island areas in Alabama too. Fri, Sep. 17: 1, 2, 3; with pictures: 1, 2, 3. We might all have to swim from Pensacola airport to Pensacola Beach, which seems to be an island now. Water is warm though. Sat, Sep. 18: 1, 2. "In Florida, damage was equally widespread in sections of downtown Pensacola and across Pensacola Bay in Gulf Breeze. Reporters were not allowed to cross the bridge to Pensacola Beach..." "President Bush is supposed to tour damage Sunday, starting from Pensacola." Sun, Sep. 19: 1. "US President George W Bush on Sunday returned to hurricane-ravaged Florida to witness the devastation wrought by Hurricane Ivan and comfort storm victims in a campaign battleground state that could determine whether he wins a second term in office. The Republican incumbent, eager to show a compassionate face to Florida communities hard-hit by three hurricanes in just over a month, toured storm-blasted neighbourhoods near the Florida Panhandle city of Pensacola then flew by helicopter to nearby Orange Beach, Alabama." Tue, Sep. 21: 1, 2; with pictures: 1. "A week after residents of Pensacola Beach, Florida fled under threat of Hurricane Ivan -- they still aren't allowed to return". "..the shores of Pensacola Beach resembled a war zone. Dozens of homes and condos were demolished. The roof of the Holiday Inn was smashed, while two giant holes were torn in the side of the Dunes hotel." Lots of Pensacola Beach pictures taken from the air, thanks to Bryan Adams. "The devastation is NOT as bad as it may first have seemed. ... I am very surprised by the number of survivor properties. My heart goes out the ones that are destroyed, but it is fewer than I had imagined." Thu, Sep. 23: 1, 2. Listen to NPR report about Pensacola Beach. "Residents of one Florida panhandle beachfront town [Pensacola Beach] were allowed back into their homes Thursday." Sun, Sep. 26: 1. 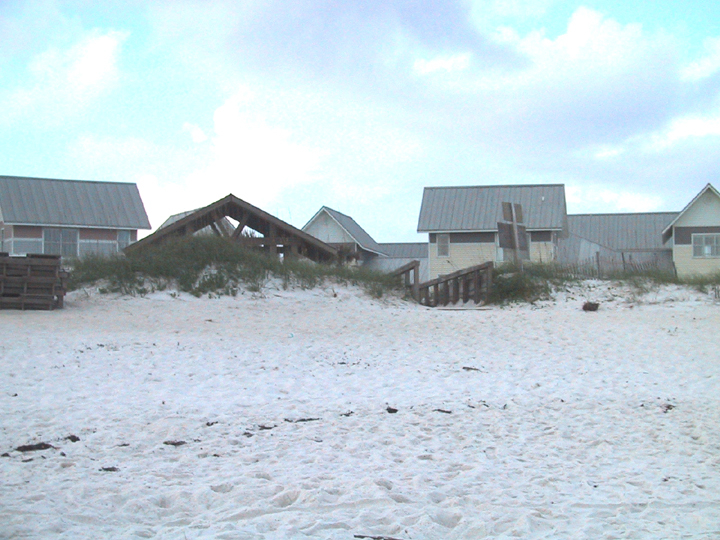 "Pensacola Beach will be open from 8 a.m. to 5 p.m. on Sunday and Monday. Residents, property managers, leaseholders, business owners and property owner representatives will be allowed to secure their property and get personal belongings." "On Pensacola Beach, road workers have been successful in opening additional roads, including the roadways to Portifino and Fort Pickens to aid citizen access". Mon, Sep. 27: 1, 2, 3, 4, 5. Some catchy pictures from the news: 1 (enable plug-ins in your browser). "Hurricane Ivan mostly just rearranged the snowy white sand on two barrier islands in the Florida Panhandle, but nature will need help putting it back where it was." "That sand is $20-a-yard sand. We just put $20 million back on Pensacola Beach and we want to save as much as possible." "The curfew for all of Escambia County, including Perdido Key and Pensacola Beach has been lifted". "Today is the last day Pensacola Beach and Perdido Key residents can visit their property so that cleanup crews can begin debris removal. As crews clear an area, it will reopen to residents." "Power was restored to portions of the core area of Pensacola Beach on Saturday, allowing some businesses to begin cleaning up on Sunday." "The last time so many storms struck the same state in one season was 1886, when Texas took four direct hits from hurricanes." "Ivan lost strength before making landfall near Mobile, Alabama, but the hurricane's front right quadrant - which always packs the most powerful punch, because it combines the speed of the storm's winds with the force of its forward motion - slammed into Pensacola, Florida." "..it would be a mistake to assume that Florida is going to get this kind of pounding every year." "People say 'We've had two hurricanes in three weeks.' They need to understand the statistics. We might not get another hurricane in their lifetimes." "..one of the world's foremost long-range hurricane forecasters thinks the worst might be over for this year." I am not sure I can locate Clarion Suites Resort and Convention Center on the pictures. Exercise for those who attended G3 in 2002: is it on this picture (scroll down)? Compare with our 2002 picture and with the Clarion's own website: 1, 2. If it is, then it seems to be in a reasonable shape. For now, G3 conference is renamed to G2.5 conference, since not much of the Gulf Coast seems to be left there. We are moving to a new location: Hampton Inn in Destin, Florida. The conference room there is smaller than in Pensacola. Please be prepared to squeese a bit. Otherwise, the hotel is cheaper, and that is a great place 100 yards/meters from the beach. We would need either to change the tickets (the hurricane should be a sufficient reason for an airline to allow that) or to drive for at least 1 hour 24 minutes from Pensacola to Destin. In the latter case, there is no way to miss the "scenic" view of the Gulf Coast left after the hurricane. No hurricanes will diminish mathematicians' will to learn.